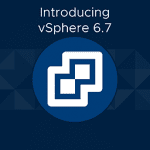 VMware vSphere 6.7 | Parallels RAS Supports It to make your life easier! Based on vSphere 6.5, vSphere 6.7 is a technological innovation and boosts the customer experience. It provides outstanding simplified management, operational efficiency, and faster deployment time. vSphere 6.7 delivers an excellent user experience via the enhanced vCenter Server Appliance (vCSA). It introduces new APIs that improve the ability and expertise to deploy vCenter, use multiple template-based vCenters, and simplify management of vCenter Server Appliance, as well as enhancing backup and restore capabilities. When updating ESXi hosts, vSphere 6.7 improves efficiency at scale, while reducing maintenance time by cutting down one of two reboots usually required for version upgrades. Additionally, vSphere Quick Boot is an addition that reboots the ESXi hypervisor without rebooting the physical host, avoiding time-consuming hardware initialization. Another component that allows vSphere 6.7 to present a simplified and efficient user experience is the graphical UI. The HTML5-based vSphere Client presents a modern user interface experience. On vSphere 6.7, it includes functionality to support features like managing NSX, vSAN, and VUM, as well as third-party elements. The security capabilities of vSphere 6.7 are built from vSphere 6.5 and leverage the unique position as the hypervisor to offer complete security that rises from the core. vSphere 6.5 introduced data encryption. On vSphere 6.7, VM encryption is further improved and more straightforward to manage. vSphere 6.7 is designed to protect data continuously while increasing the security of VM encryption and providing the user with excellent protection against unauthorized data access. Introduced as a universal application platform, vSphere 6.7 supports new workloads—such as 3D graphics, high-performance computing (HPC), big data, in-memory, machine learning, and cloud native—as well as existing applications. By virtualizing Nvidia GPUs, vSphere 6.7 further enhances the support and capabilities through VMware’s collaboration with Nvidia, even for non-VDI and non-general-purpose-computing use cases such as AI, machine learning, and more. With vSphere Persistent Memory, customers using hardware modules (such as those available from Dell-EMC and HPE) can leverage them as super-fast storage with high IOPS—or present them to the guest operating system as non-volatile memory. vSphere Persistent Memory significantly enhances the OS performance as well as applications, making current applications quicker and enabling the creation of new high-performance applications. VMware is committed to delivering a seamless hybrid-cloud experience with the utilization of vSphere-based public clouds such as Amazon Web Services™ (AWS), as well as other public cloud providers. Introducing Cross-Cloud Cold and Hot Migration in vSphere 6.7 further enhances the management across clouds and enables a seamless, non-disruptive hybrid cloud experience for customers. vSphere 6.0 began provisioning between vCenter instances which is called “cross-vCenter provisioning.” Using two vCenter instances introduces the possibility of different release versions. In vSphere 6.7, customers can use various vCenter versions while letting cross-vCenter, mixed-version provisioning operations (vMotion, Full Clone, and cold migrate) to proceed seamlessly. Version 16.5.1 of Parallels® Remote Application Server (RAS) supports up to the latest VMware vSphere v6.7. This allows businesses to deploy an application and desktop delivery solution while utilizing all significant hypervisors, including any VMware-based hypervisor. Leverage a complete cloud deployment model offered by Parallels RAS by choosing which models you want to utilize. Download Parallels RAS for your ESXi with a 30-day trial today!